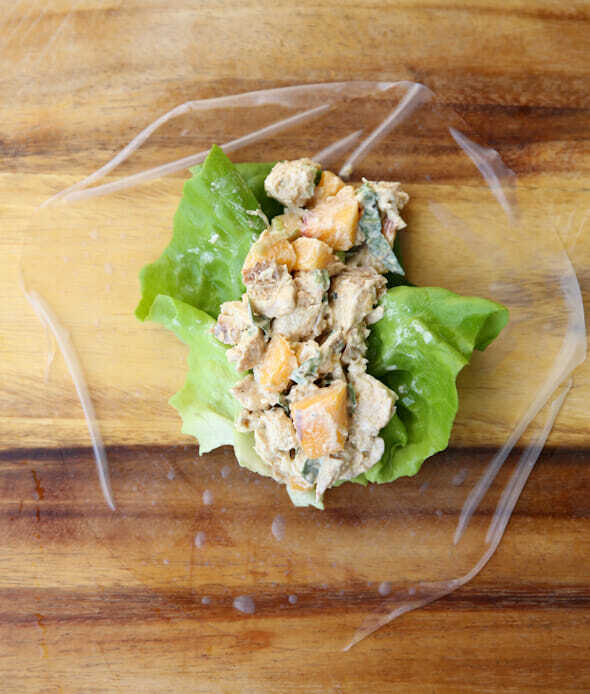 You all know we love a good chicken salad; we’ve got several on this site and in our cook books. If you follow our Fit Club on instagram (@ourbestbites_fitclub) I posted this week how I always keep portioned bags of cooked chicken in my fridge for quick meals, and chicken salad is one of my go-to’s. This is a unique twist on the flavor aspect of the classic recipe, but also the form, as I’m rolling them into spring rolls. 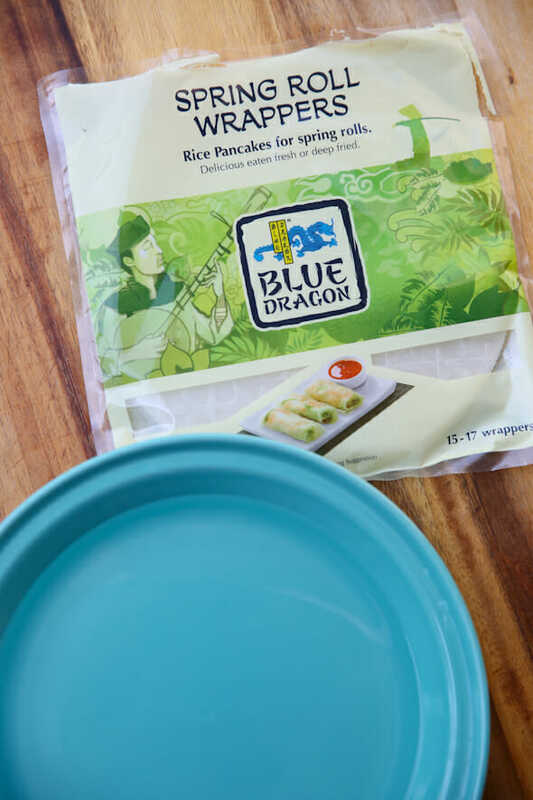 Spring roll wrappers are made of rice and they’re a low-calorie and gluten free option when it comes to wrapping things. If you’d prefer to eat the salad alone, be my guest, or it also is great in just a simple lettuce wrap. 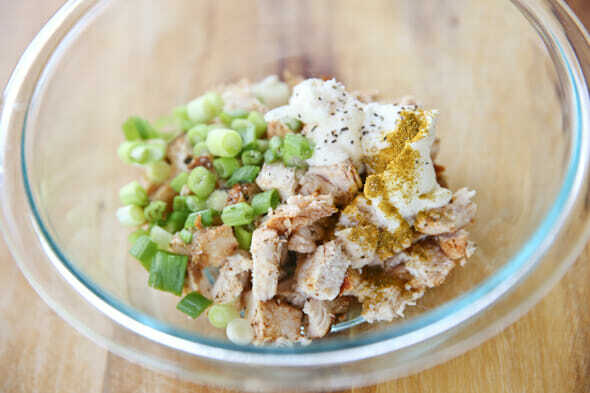 Start off with a pretty basic chicken salad combo with cooked chicken, green onions, a little sour cream and mayo (I use light for both), and some salt, pepper, and curry powder. It’s not abnormal to have something juicy and sweet in a chicken salad. Often times you see grapes, or even tropical mango and pineapple in our Teriyaki Chicken Salad (have you guys all tried that one? Super old post; it’s the bomb.) So in this case I’m using sweet, ripe peaches, which you can still find in season right now. For a different flavor profile, I’m adding lots of fresh basil as well. 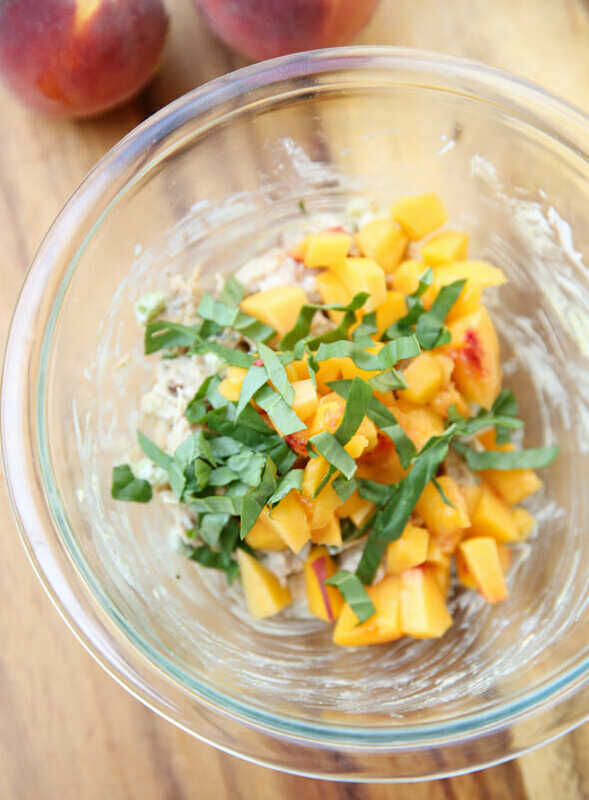 It pairs really nicely with the peaches and adds so much extra flavor. Since fresh basil isn’t as potent as dry basil, you can really be generous here, and even add more than I’m calling for in the recipe. Now that your chicken salad is ready, you’re ready for your spring rolls. If you’ve never used them before, you find them in the Asian aisle of the grocery store. They come in round sheets and they kind of look at feel like they’re made out of plastic or something! 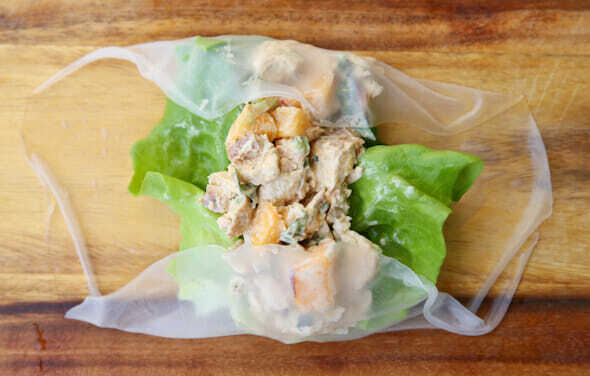 You just need a large plate or pan of water, and once you dip the wrappers in the water for just a minute, they turn into a soft, pliable wrapper. To roll them, simply fold two sides in, and then roll them up. Kind of a fun twist on your average chicken salad. 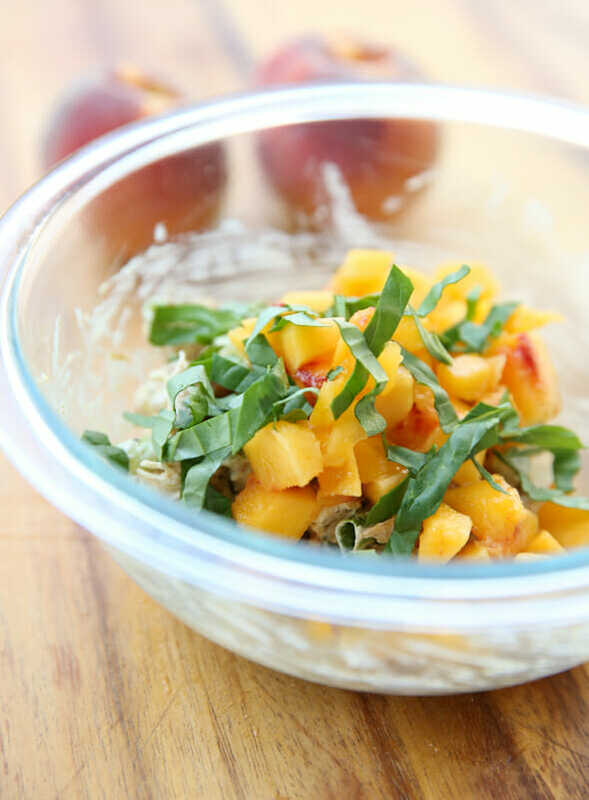 Take advantage of fresh, yummy peaches and sweet basil while they’re in season! 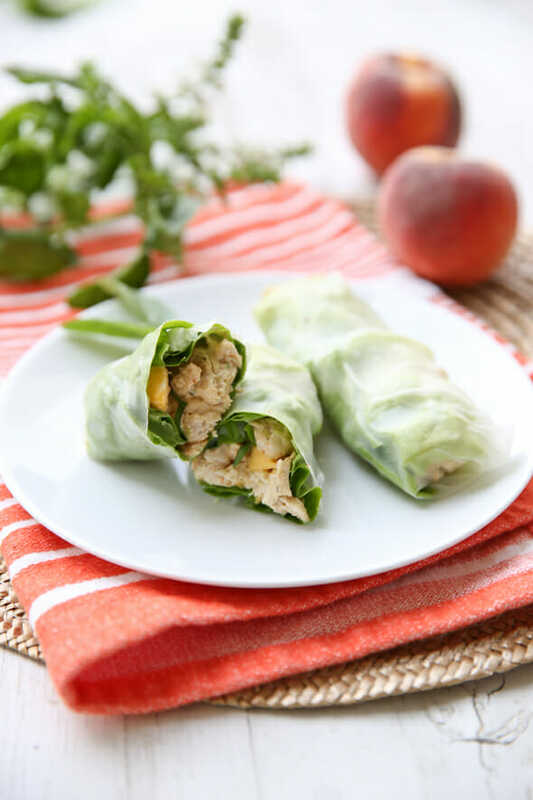 Light and flavorful spring rolls filled with a peach and basil chicken salad. Combine chicken, mayo, sourcream, green onion, salt, pepper and curry. Gently fold in peaches and basil. Prepare spring roll wrappers according to directions on package. 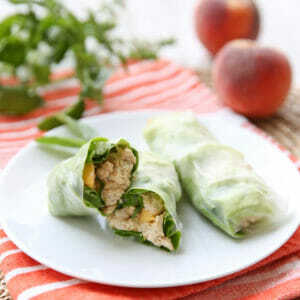 Place a lettuce leaf in the center of each roll and fill with chicken salad. Continue with remaining rolls. Have you checked out Pinners Conference? We’ll be in Utah with a pop-up shop, AND teaching two fun classes! Check it out, here! Peach and basil are two things I’d typically put together. I guess that’s why I leave the cooking to food bloggers and nice people like my wife. Maybe I should surprise her and make this because I know she would like!!! What a clever and delicious idea! These would be great to serve at a shower or something instead of the standard chicken salad with grapes on a croissant, just to change it up a little. Looks delicious. This is a great recipe to use for leftover Costco chicken. 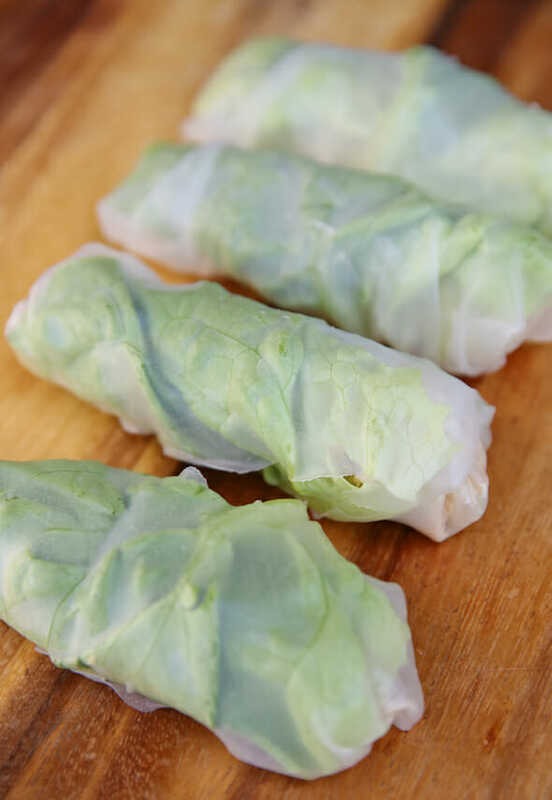 I always use green lettuce for spring roll wraps. For added veggies, I add julienned cucumber and carrots. These look so delicious! I’m definitely adding them to our menu plan next week! I wish I had this right now. You’re healthy chicken salad is my favorite and since I’m addicted to pizzas at the moment, I can’t imagine this wouldn’t be heavenly! 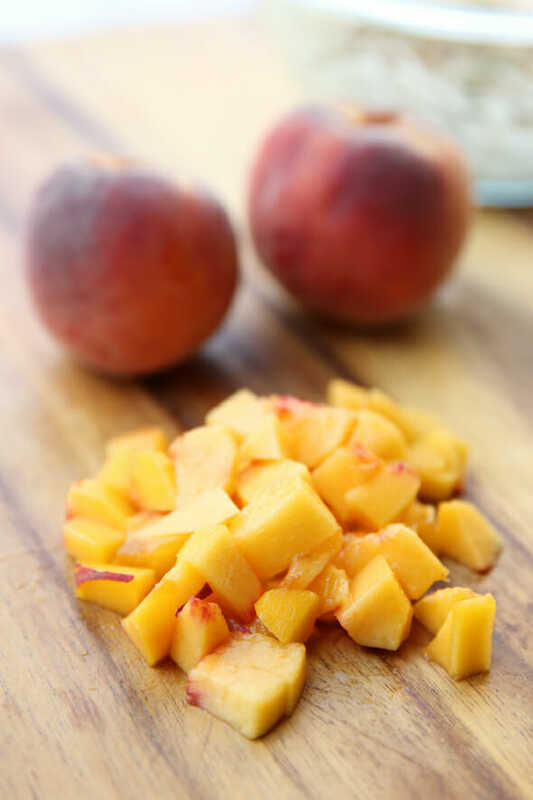 As a sidenote, my favorite snack right now is to cut up a peach, pour a little bit of almond milk in there, and throw a couple tablespoons of lower calorie granola that I found at Winco and maybe a little sweetener…so good! Peach season is my favorite! Yum, these look so good. I love the sweet and savory combo for this finger food. I never would have thought of peaches, but Im going to have to give it a try. Our whole family loved these!! I just added some sliced almonds and a few big squirts of lime juice. Perfect for summer!